Now live online at ITV’s Borderlife you can see our Director Tim Chamberlain and Instructor Carla Sayer helping Lori have a fabulous Wild Tree Adventure up in amazing oaks in the grounds and gardens of Bowhill House. 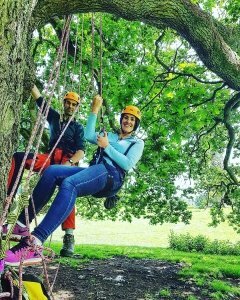 Feeling brave, ready for your very own Wild Tree Adventures? You are in luck – we have ace events coming up so?Book Now?quickly before they sell out! For all ages from 6 years and up. Look forward to having you climb with us!